The Seebüll art school offers courses and workshops for children, youth and adults. The enjoyment of art, experimentation with various techniques and materials, and individual creativity stand in the focal point. We let ourselves be inspired by Nolde’s work, his garden, and the unusual landscape of North Frisia, while we tackle selected themes and look at the working methods of other artists. Thus everyone discovers their creative potential and can choose from a large palette of artistic possibilities. Between April and October we offer 20 courses on various topics. We look forward to your attendance. 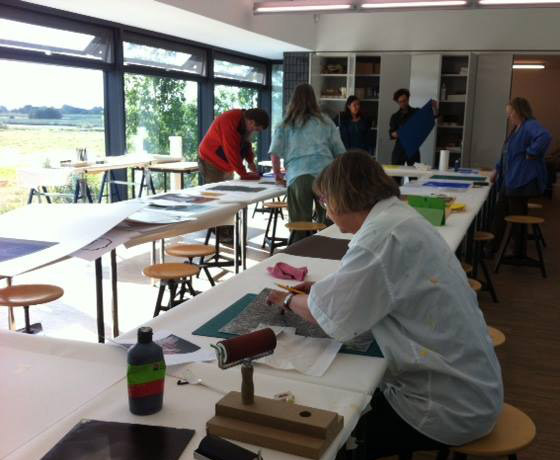 For the entire range of courses and workshops we offer families (2 adults with max. 3 children) a 10 percent discount. Registration is possible at any time up to the beginning of the course. Please note that cancellation (by phone or in writing) is possible without charge only up to five days before the course begins. Thereafter there will be a per-person charge of 50 percent of the course fee. For excursions, registration is necessary before the stated deadline (see the art school program). Please note that cancellation (by phone or in writing) is possible without charge only up to the stated deadline. Thereafter the entire participation fee is due. Courses may be cancelled on short notice if the minimum number of five participants is not reached.